Located in Menton, this air-conditioned hotel is just 25 metres from the beach on the Mediterranean coast. It has a floral garden and offers soundproofed accommodation with free Wi-Fi access. A flat-screen TV with satellite channels is provided in the guest rooms. All of the rooms have a private bathroom. A breakfast buffet with regional dishes is served each morning. Guests can relax with a drink in the Londres Hotel’s bar or in the garden. 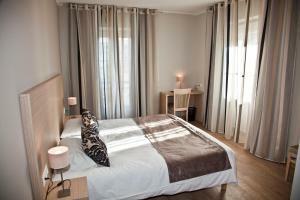 Hotel de Londres is just a 5-minute walk from Menton SNCF train station and the local casino. The Saint-Michel Basilica is 1 kilometre away. Please note that there are 3 parking spaces available on site.